In an enchanted forest, the maiden Rapunzel’s beautiful voice captivates a young prince hunting nearby. Overcome, he climbs her long golden hair to her tower and they spend an afternoon of passion together, but by nightfall the prince must return to his kingdom, and his betrothed. Now king, he weds his intended and the kingdom rejoices when a daughter named Snow White is born. Beyond the castle walls, Rapunzel waits in her crumbling tower, gathering news of her beloved from those who come to her seeking wisdom. She tries to mend her broken heart but her love lingers, pulsing in the magic tendrils of her hair. The king, too, is haunted by his memories, but after his queen’s mysterious death, he is finally able to follow his heart into the darkness of the forest. But can Rapunzel trade the shadows of the forest for the castle and be the innocent beauty he remembers? Carolyn Turgeon is the author of Rain Village, Godmother: The Secret Cinderella Story, Mermaid: A Twist on the Classic Tale, and the young adult novel The Next Full Moon. She is the editor of Mermaids, a special-edition annual magazine, and teaches writing in the low-residency MFA program at the University of Alaska at Anchorage. Find out more at CarolynTurgeon.com and IAmaMermaid.com. "Turgeon incorporates a sense of melancholy that adds an enormous amount of depth and sympathy. . . . Rapunzel's . . . absolute devastation at a shocking discovery ring[s] true, adding a layer of realism to the magic-sparked tale. Lovers of fairy tales will enjoy Turgeon's fresh take on classic stories." "The connection Turgeon makes between the two familiar fairy tales brings out the humanity in the 'wicked queen' of the Snow White story, making the reader see how she came to be who she was. Fans of fairy tales and paranormal romances will both enjoy this magical little tale." "Intricate, inventive, and charged with magic. Carolyn Turgeon masterfully clears the mists of fairy tale and legend to reveal the complex humanity that lies beneath the stories of Rapunzel and Snow White." "I loved this unexpected spin on the story of Rapunzel, a strong-willed devourer of hearts. Be careful, she just might take a bite of yours." "Magical, mythical and totally original, Turgeon's haunting story of Rapunzel and Snow White unfolds like a waking dream, with prose that shimmers like cut diamonds. About love, longing, and loss, it turns the fairy tale into something as provocative as it is profound." "Forget everything you know about fairy tales filled with glamorous princesses and happy endings. In Carolyn Turgeon's skilled hands, characters that have long been the bedrock of literature come to life, revealing their all too human desires, and a mesmerizing, hidden darkness. Her body of work is already substantial and growing, which is good news for readers everything. Fairest of Them All will move her into a larger sphere, worldwide. I loved this book from start to finish." 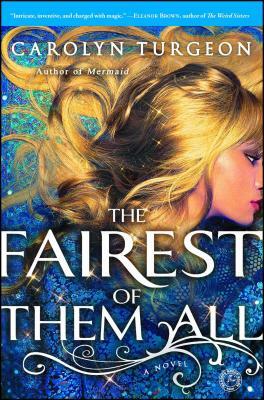 "To call Carolyn Turgeon’s The Fairest of Them All a retelling doesn’t seem quite accurate. This story of Rapunzel and Snow White may feel as familiar as it is thoroughly innovative, but it reads like an original – like the real story. Turgeon has managed to peel back centuries of dressing and sweetness and lace that have been heaped upon these characters. She has plucked them from their perfumed clouds, and returned them to their primal form, to the unique women they were once, before their fairy tales diluted them. In gratitude, they sing from the pages, all full of suffering and longing and ferocious intellect. This is the Rapunzel I have always wanted to know." "I love all of Carolyn Turgeon's novels, and this is her best yet. Sensual and captivating, The Fairest of Them All follows the life and loves of a classic fairy-tale villain – the Wicked Stepmother. We gain sympathy for this devil, as the novel fathoms the depths of her vanity and her history of heartbreak. I was ready to follow this magical story anywhere it took me, and it was full of surprises and delights every step of the way."